Hungary’s governing party Fidesz has recently consolidated changes to the constitution, media laws and electoral constituencies. Yet despite international criticism and tough economic times, Hungarian opposition forces are divided while Fidesz and the radical right party Jobbik remain electorally buoyant. Erin Marie Saltman examines the enduring strength of the Hungarian right and the obstacles facing its opponents. In Hungary 15th March is a day with a deeply resonating political legacy. The day is a national holiday, created in remembrance of the 1848 revolution when Hungary’s iconic poet revolutionary Sándor Petőfi stood on the steps of the National Museum and read his Twelve Points demanding freedom of speech and national political liberties from the Habsburg Empire. Today Petőfi has become a malleable political symbol of revolution and change for government and opposition alike, with both groups moving to celebrate his legacy. The conservative Fidesz government sees itself as personified in the Hungarian revolutionary tradition, calling the huge electoral majority that put it into power in 2010 a ‘voting revolution’ – an opportunity for Hungary finally to rid itself of its history of oppressive powers, first the Habsburgs and then the Communists. In Prime Minister Viktor Orbán’s national speeches, there is now wariness towards the assimilating and constricting measures of the EU and IMF, asking whether these international institutions bear the same hallmark of oppression. Backing the government, which still holds a strong lead in polls among decided voters, are throngs of dedicated supporters holding ‘peace marches’ and rallies to show their continued support. 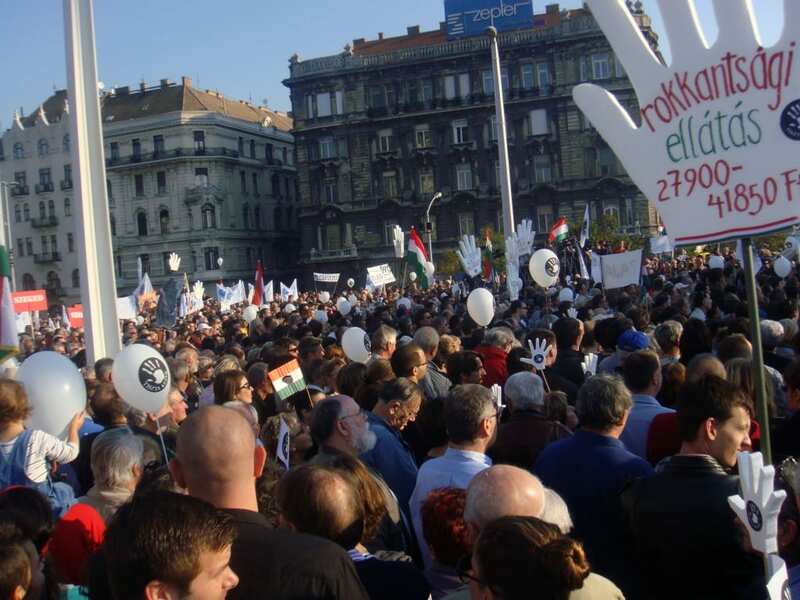 A new opposition grouping has emergence in Hungary, calling for an electoral alliance of grassroots movements and political parties to challenge the dominance of right-wing party Fidesz. However, it may soon find its cohesion testsed, writes Erin Marie Saltman. ‘Together 2014’ (Együtt 2014) was announced on 23 October at the large opposition rally against the government, founded by three civil society organizations. With largely divided and conflicting opposition facets competing in Hungary the question remains: how together will Together 2014 be?